The City Aid Center takes lead in providing focus assistance to internally displaced persons. This was reported through findings of the independent sociological survey carried out by Independent Researching Group, USAID and the Charitable Fund “Child’s Smile”. The armed conflict in the Eastern Ukraine has affected not only Ukrainians, but also the entire world community. Influential international organizations engaged in charity work, responded to the needs and sent to Ukraine huge humanitarian aid for civilians affected by the war. Ukrainians themselves did not stay aside. Owing to the help of help centers organized across the country, thousands of families who had fled from the occupied Donbas, received assistance in relocation and settling on a new place. According to the survey performed within the time frame June – September 2015, almost half of the internally displaced persons who have moved to our city, came to get assistance to The City Aid Center (45.4%). To date, according to the Office of Labor and Social Protection of Zaporizhzhya oblast, there are more than 100,000 internally displaced persons living now in our region. 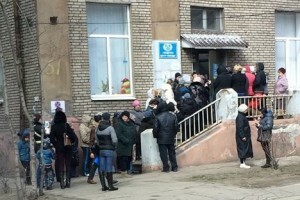 The sociological data prove that the population from the eastern oblasts – Donbas region – faced a number of challenges. According to IDPs, the major challenge is to find a place of living. High rent rates and increased negative prejudice implied difficult choices for the displaced people: staying on peaceful territory or return home. An issue of unemployment is still relevant for many IDPs today – only 17,1% of them have a steady job. As for moral dimensions of the IDPs’ life, an encouraging fact, indeed, is that most of them do not perceive discrimination from the local community. However, this does not exclude an issue of missing new friends and lack of worthwhile cultural activities and leisure time. Starting from the time of first influx of the displaced population to Zaporizhzhya, The City Aid Center has committed to providing IDPs with necessities. The Center’s facility is always open for those who are experiencing difficulties while settling on a new place. In the Aid Center, the displaced people can get clothing, food assistance, as well as receive psychological and legal advice. Volunteers of the Charitable Fund “Child’s Smile” also provide the humanitarian assistance. Their office serves as a center of humanitarian aid (clothes, baby food, and hygiene items). It is noteworthy that the activities of the City Aid Center extend far beyond the boundaries of our city. More than 2000 IDP households who are still living in the buffer areas in ATO zone received assistance. This has been made possible thanks to cooperation of the City Aid Center and NGO GlobalMedic, Canada. In April 2015, the volunteers visited 8 locations, situated along the border line to the ATO zone: Popasnaya, Lisichansk, Avdeevka, Krasnohorovka and other locations in Donetsk and Luhansk oblasts. The people received food assistance, basic hygiene items and the emergency water-purification tablets Aquatabs. In addition to the humanitarian aid, The City Aid Center provides support in the sphere of psychological rehabilitation and socializing of internally displaced persons. More than 200 children, including 100 kids among the IDPs families vacationed at the seaside of Azov sea health camp “Round-the-world Voyage in 6 days”, held by The City Aid Center in cooperation with the organization “Club Future of Ukraine”. The staff and volunteers of The City Aid Center do not stand still and undertake next steps, developing new programs and projects for providing focus assistance to IDPs, involving them in different leisure activities and helping them solve everyday practical problems. You may see the results of assessment surveys of the living conditions of the internally displaced people who live in Zaporozhye here.